TORONTO - TSN is home to more NCAA HOCKEY games than ever before throughout the 2015-16 season. The network's 44-game U.S. college hockey schedule features comprehensive coverage of the NCAA TOURNAMENT culminating with coverage of the FROZEN FOUR in Tampa Bay, Fla., running April 7-9, 2016. TSN's 2015-16 NCAA HOCKEY schedule begins this week with Northeastern vs. Notre Dame on Thursday, Nov. 12 at 7:30 p.m. ET on TSN2, followed by a rematch of last year's championship game with Boston University vs. Providence on Friday, Nov. 13 at 6 p.m. ET on TSN2. TSN's expanded coverage of NCAA HOCKEY is available for live streaming and on demand viewing to TSN subscribers through TSN GO. "With a huge crop of emerging stars and high-performance play, NCAA HOCKEY is a fantastic property for Canadian hockey fans," said Shawn Redmond, Vice-President, Programming, TSN. "We look forward to showcasing the highly anticipated FROZEN FOUR tournament in April, a great complement to our package of NCAA championships that includes NCAA March Madness and the College Football Playoff." 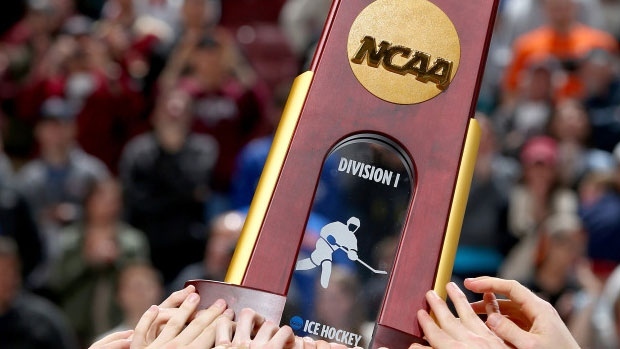 "TSN's coverage of NCAA HOCKEY generated tremendous excitement last season and we look forward to building upon that success," said College Hockey Inc. Executive Director Mike Snee. "Nearly 30% of NCAA players are Canadian so it makes sense to provide hockey fans in Canada an opportunity to follow NCAA HOCKEY throughout the winter. Also, having access to so many games allows young aspiring hockey players in Canada the opportunity to see what makes the U.S. college game so special."